New car buyers made savings of over £2300 on average at the end of last year, despite a gradual fall in manufacturer discounts during the last quarter, according to the latest What Car? Target Price Report. Analysis by mystery shoppers of the UK car market as part of the What Car? new car buying service, found average new car discounts fell from £2590 in September to £2369 at the end of November – a drop of £221 and 8.51%. 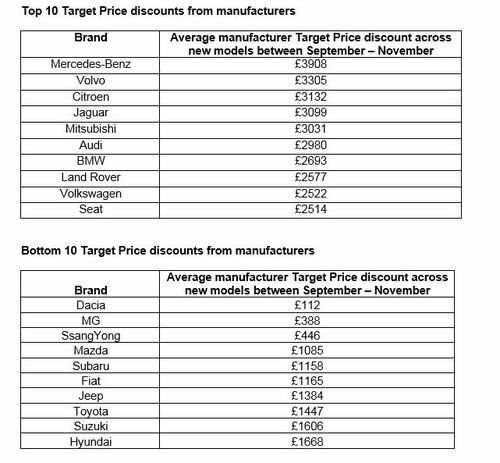 The biggest discounts were seen in the luxury car sector where manufacturers actually increased the level of discounts, cutting prices on average by £5639, up from £5482 – a rise of 2.87% since September. Executive car buyers saw the second-highest discounts at the end of November, with £3190 off the average list price, while Coupe buyers were given the third highest offers, with £3153 cash savings on a new car. While luxury car buyers enjoy the biggest savings on a new car, small car buyers are given the lowest offers. At the end of November, the average discount on a new small car stood at £946, a fall of nearly 20% since September. Diesel and petrol cars saw their average discounts fall by 6.73% (from £2892) and 5.31% (from £2234), respectively, with the average diesel and petrol buyer saving £2697 and £2104 on a new car. 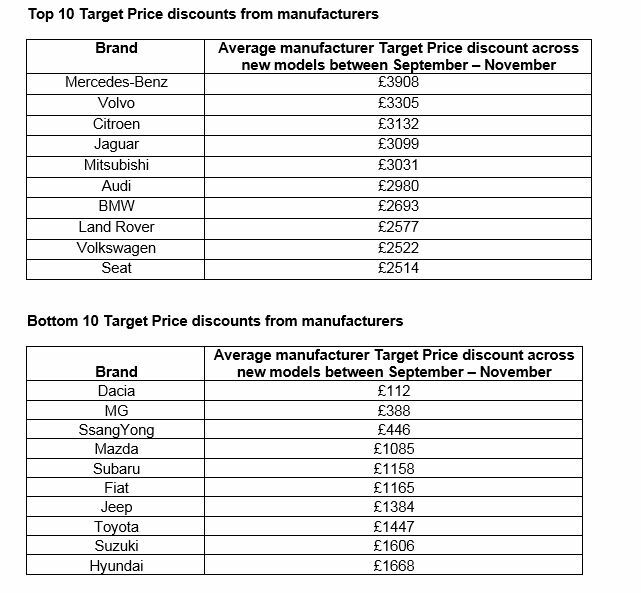 Buyers who visited Mercedes-Benz dealerships in this period fared better than anyone else, with the German brand offering the highest discounts across its model range, at £3,908. At the other end of the scale, budget brand Dacia was found to offer the lowest price reductions across its model range of £112. Steve Huntingford, editor of What Car?, said: “As the scale of discounts make their customary year-end dip, our figures show there were still deals to be had, underlining the importance of thorough research when negotiating.